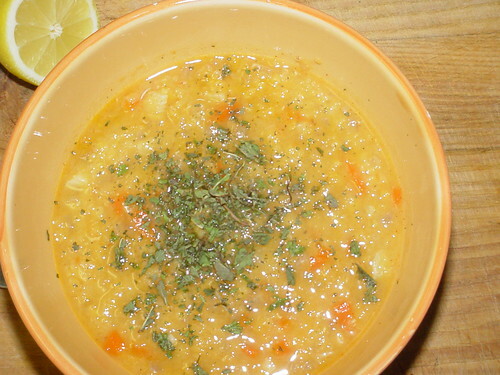 Red lentil soup (even though it looks more orange or yellow after it’s cooked) cannot be simpler to make. Sautee a bunch of onions, garlic and some chopped carrots in olive oil, add the red lentils and stir for a few minutes. I also had a half tomato, so I threw it in there. Cover the whole thing with water and let it simmer. Nothing to it, and makes for a light a delicious meal. The other part of the meal was a recipe from ‘Happy in The Kitchen’, Braised Carrots with Carrot-top Sauce. A great dish that you can read more about here. Well, ok, it does have a few tablespoons of chicken stock. Sorry ‘bout that. I could’ve easily substituted some vegetable stock for the chicken, but I wanted to stick to the recipe.